Q：What is the meaning of the item name? 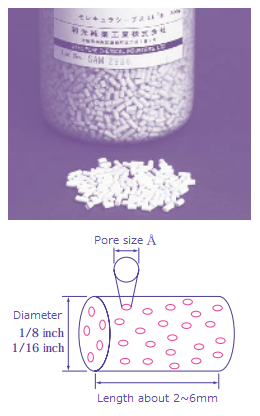 A：3A, 4A and 5A represent pore diameters on the surface of molecular sieves. 3A means 3Å, 4A means 4Å, and 5A means 5Å. Only 13x means 10Å. 1/8 and 1/16 are the diameter of the pellet. 1/8 inch ≅ 3.2 mm φ, 1/16 inch ≅ 1.6 mm φ. The length of the pellet is about 2 to 6 mm and is not constant. ※ Note: Since adsorption port diameter is in order of 3A <4A <5A <13X. If a molecules adsorbes on 3A, it adsorbes to all 4A, 5A, 13X. Q：How can it be used? A：The drying capacity of molecular sieves is theoretically about 20 ~ 25% of its own weight. Add molecular sieves of about 3 to 4 times of the calculated amount of the organic solvent, and leave it for about 24 hours with occasional stirring. The time varies depending on the type of solvent, but leave it a few days if it is hard to dry. Q：How can it be reproduced? A：Air dry first, and remove the solvent attached to the surface. If alcohol etc. remains on the surface, there is a danger of catching fire during heat treatment. Heat at 150 ~ 180°C for 2 ~ 3 hours, then heat at 300°C for 3 ~ 4 hours. Molecular sieves cause structural anomalies above 700°C, so be careful when heating. After drying, put in a desiccator and cool. (Molecules with effective diameter >3Å) Drying of cracked gas, ethylene, butadiene, ethanol, etc.